Bristol’s Die-Cutting capabilities allow us to provide three dimensional protection for shipping and storing your valuable equipment. We can die-cut a wide variety of materials including high density foam inserts for lightweight protection. Tell us what you need to pack and we will recommend a solution to fit your needs. 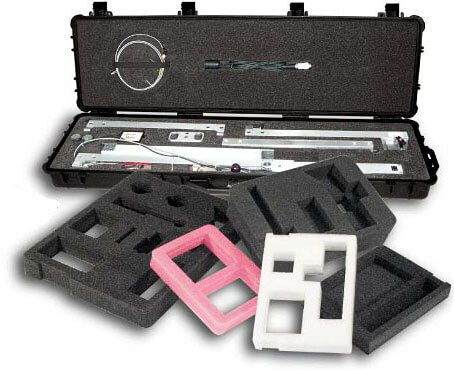 Purchase one of our Pelican Cases (or any case) and we can customize a foam interior—keeping your equipment safe. Whatever equipment you want to ship or store (computers, cameras, audio, video, trade show displays) we can die-cut inserts to your specifications. Our die-cut materials come in a wide selection of materials and colors. Bristol can customize inserts for any case or build one of our superior Bristol Cases to your specifications with die-cut inserts. We can also die-cut paper or board for point of purchase or promotional store displays.